When I was a kid, my grandma taught me to knit, and I made a few simple little things. In middle school and high school, I’d knit skinny “fashion scarves” with fluffy sparkly yarn, and I did some granny-square blankets, teddy bears, and mittens with the church youth knitting group (I was suuuuper cool /sarcasm). I hadn’t really touched it at all since starting college, but I noticed it becoming popular again among my generation in the past five or so years. 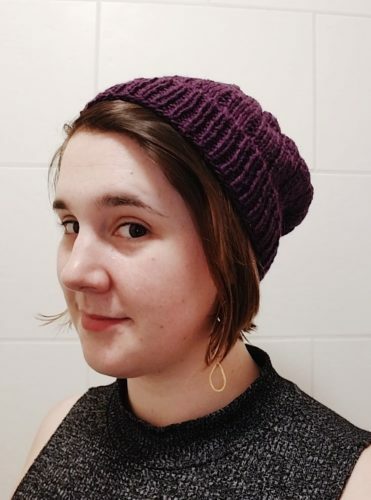 So, I finally properly picked it up again earlier this month and knitted a hat! Checking the circumference and length of the body of the hat. Yes, I’m using a paper clip for my row marker. 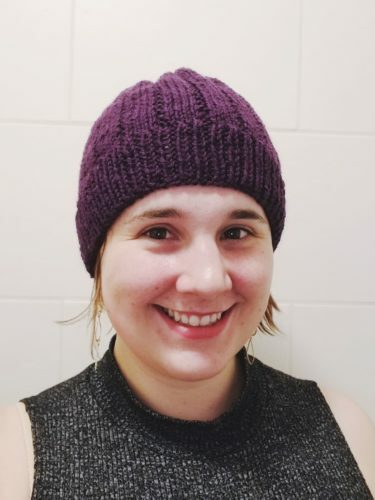 At the suggestion of the ladies at Sticks & Strings in Lansing, I joined Ravelry and found a cute, easy pattern for a winter hat (/toque, for Canadians). I used the Bankhead pattern by Susie Gourlay, adult size large. It fits pretty perfectly! Have a look at my project page on Ravelry for the technical details. I’ve noticed that it’s easier now to do “longer” patterns while binge-watching tv shows! I also have a longer attention span as a 28 year old than I did as a 12 year old. 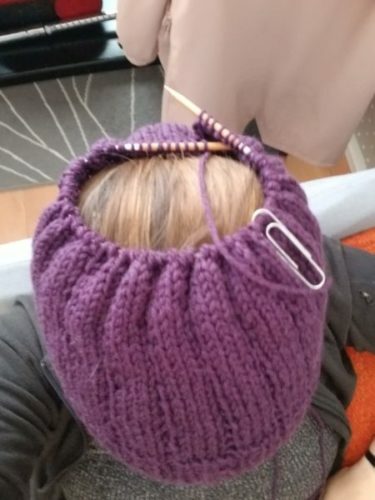 I made this hat in probably 5 days (two weekends and a workday evening) working at a leisurely pace. I’d say it was relaxing to work on this, but mostly, it was nice for my anxiety to be channelled in a focused, creative outlet where the input-output relation (so much work for so much result) is basically linear  I’m looking forward to the Fiber Arts Fest in Ann Arbor in October! Comments Off on I knitted a hat!